We recently purchased a home, which was originally built in 1948. I was just puttering in the back yard when I discovered a sheared metal post in a cement foundation. I figured I would dig the post out. This wasn’t easy but it was gratifying. At the end I had a 1′ deep hole in my back yard and some angry ants. I saw what looked like a white button at the bottom of the hole. 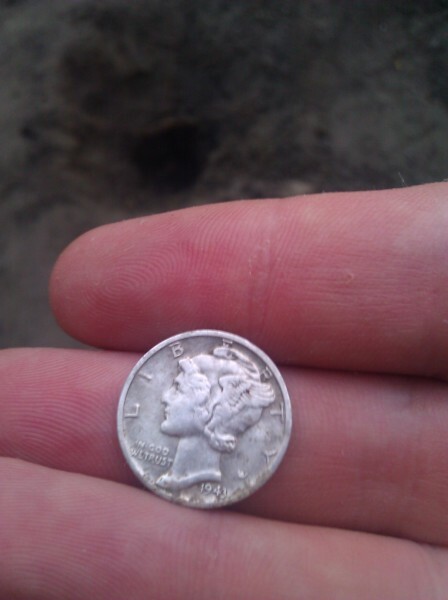 A silver “Mercury” dime from 1943, which I just found in my yard. After cleaning it off, I found that it was a 1943 US dime, with a bust of MercuryLiberty. Neat! I’m not sure what purpose the metal post must have served, (I reckon it was the base of a clothes line) but it must have been installed around the time the house was built. I have to wonder if whomever dug the original hole left this souvenier to the future on purpose, or if the dime just slid out of his pocket. Previous: Review: Stratford Diner by Dan B.